Juan Kidd is a name that crashed on the house music scene with his Defected Records’ Beatport No1 track, ‘Now You're Gone’. Since then he has been championing uplifting house music with releases on 303 Lovers, Defected, Size, Toolroom, Monique Music, Great Stuff, Re Birth and Factomia to name a few. 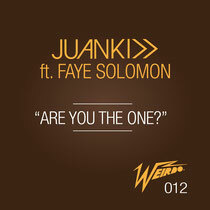 His next release, ‘Are You The One?’, featuring newcomer Faye Solomon, is on his own label Weirdo Recordings and blends old skool music with deep house beats. Juan proves his versatility by making music that fits in small intimate venues to main stage festivals, and you'll possibly hear his music in clubs as varied as DC10, to Space and Pacha. He has gained respect for his DJ sets, mixing drum loops with basslines and acapellas, and making music whilst DJing. The reason he is resident at Sankeys is because of his versatility in being able to play before and after any big name DJ. 2013 saw a heap of releases on the aforementioned labels and his new label, Weirdo, is currently getting a lot of love from UMEK, Mark Knight, DJ Chus, Bushwacka! and Jozif, to name just a few. Check ‘Are You The One?’ below, it’s out now.